It’s still January, but Spring is fast approaching which means you’ll soon be out and active in your garden. Through the winter period, trees can become damaged and therefore a potential danger to you and your family. Fallings trees, limbs and branches are something that no homeowner should have to live in fear about. 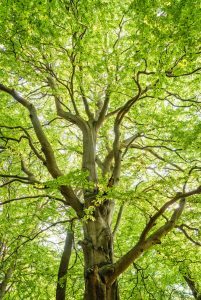 Keep reading to learn about the different ways a tree can be dangerous and how to spot them. Large splits and holes in the trunk of a tree are a tell tale sign that the integrity of the tree may be comprised. If there is not enough wood at the base to support the rest of the tree, the whole thing risks collapsing. It is also important to investigate any cavities that lie above eye level or climbing level as these may put large sections of the tree at risk. Cracks and splits at any part of the tree are considered highly dangerous as they mean the whole tree could collapse at any time. If there are noticeable streaks down the trunk or large parts of bark missing it can be assumed that the tree was most likely struck by lightning. If this is the case, keep and eye on the leaves. Your tree may recover, but if the leaves turn brow n this indicates the tree has died and is at risk of toppling over without warning. If there are mushrooms growing around the base of the tree, this means that there is a high chance that the roots have died and are now decaying. This again, puts the integrity of the tree at risk and should be dealt with as soon as possible. Depending where you live there’s a good chance your trees took a beating from the wind during the winter. High winds and harsh temperatures can have unfortunate effects on trees as a whole and especially on their branches. If there are any branches that are visibly dead or look like they are coming a bit loose, its best to be cautious and get it checked out. These tips were aimed to help inform you about how and why a tree can become dangerous. While you can do an initial check for the above yourself, we recommend contacting a skilled arborist as we deal with these issues daily. Having a professional evaluate your trees will ensure your trees are healthy and you aren’t chopping off limbs unnecessarily.